The Southeast men’s basketball team missed the Ohio Valley Conference tournament for the second consecutive year, finishing with 10-21 record overall and 5-13 in the conference. This comes after leading scorer Denzel Mahoney transferred to Creighton University during the offseason. The then-sophomore guard averaged 19.3 points per game and 5.1 rebounds per game. Mahoney was figured to be a cornerstone of the program after being named First-Team All-OVC in his second season at Southeast after named OVC Freshman of the Year. He would have been a contender for the OVC Player of the Year as a junior. 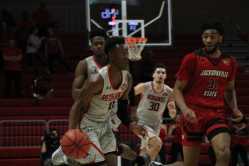 In his absence, a young Southeast squad placed 11th among the 12 teams in the OVC, closing its season Saturday with a 66-84 loss at home to Belmont University. Freshman forward Gabe McGlothan gets past a Gamecocks defender at the Show Me Center and looks to score on Feb. 9. Sophomore guard Ledarrius Brewer was this season’s leading scorer with 12.5 points per game, while freshman forward Gabe McGlothan lead the team with 6.0 rebounds a game along with 7.5 points per game. He scored a season-high 27 points against Tennessee Tech Feb. 7. Three other players transferred during the offseason: freshman forward Justin Carpenter, redshirt-freshman Ray Kowalski and redshirt-junior guard Dondre Duffus. Southeast was in the bottom half in the conference in many categories, including scoring offense with 72.2 points per game, scoring defense allowing 80.9 points per game and rebounding margin with -3.8. The team excelled in 3-point field goal percentage, ranking third in the OVC at 38.5 percent. 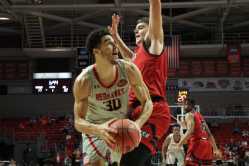 McGlothan sees giant potential for the team moving forward into the next offseason even being one of the better teams in the Ohio Valley Conference next season. Four players had prior experience to the 208-19 season: senior guard Jonathan Dalton, senior center Mark Laros sophomore guard Ledarrius Brewer and sophomore forward Isaiah Gable. However, Dalton was the only one with more than a year of Division I basketball experience. Accountability and togetherness was a huge factor. McGlothan said the Redhawks were playing for themselves rather than for the team. Ray said players were focusing too much on making the play instead of simplifying it down and just being part of the play. It wasn’t until the Jan. 17 loss to Morehead State (69-73) that priorities switched from five individuals on the court to a team. However, the team would only win four additional games for the rest of the season after winning six prior. The freshmen met with the assistant coaches and decided the mindsets needed to be changed to better the team. McGlothan said conflicting mindsets within the players impacted the culture of the team. “We all kind of expected to fall into a family, which we did, it just wasn’t as strong as we hoped to start off,” he said. Ray said consistency was a large problem this season. He was not sure what the team would do within practices and games. He hoped for a bigger growth in the team throughout the season, but a lot of growth came from the individuals players. McGlothan said his success tends to come from hustle plays, knowing that the team needed him at a specific spot for the rebound or the dunk. Ray said McGlothan is still working on letting go of mistakes within a play and not bringing them into the next play. Freshman guard Alex Caldwell sped down for a layup against Jacksonville State at the Show Me Center on Feb. 9. Other young contributing players include redshirt-junior guard Skylar Hogan, freshman forward Sage Tolbert and freshman guard Alex Caldwell. Ray said Tolbert’s figured out how to guard without getting into foul trouble, as he’s fouled out of eight games this season. He hopes Caldwell never loses his enthusiasm and passion for basketball while becoming a stronger decision maker at point guard. Ray isn’t sure who will become leaders on the team next season, but said work done off the court dictates who those leaders are. Ray hasn’t signed any players yet for next season, but he looks for guys with good character and good basketball skills. Ray wants a toughness edge in the incoming players so their focus isn’t thrown off during games against future lottery picks like Ja Morant, freshman point guard from Murray State. Ray’s looking forward to senior forward Quatarrius Wilson getting off the bench next year. He was ineligible to play this season since he transferred to SEMO from McNeese State during the offseason. While at McNeese, he averaged 10.9 points per game and was the top rebounder 10.2 rebounds per game. He collected 14 double-doubles during the 2017-18 season, which led the Southland Conference.